Rango — ILM still pushin’ new boundaries. EDITORIAL NOTE: It DID win Best Animated Feature. Gore Verbinski knows how to tell a story, regardless of whether you LIKE the story or not. And it doesn’t matter the medium he’s working in. This time around he decided to delve into animation, and with him he’s bringing along a few of his friends from his Pirates of the Caribbean circle: Johnny Depp, Bill Nighy, creature designer Mark “Crash” McCreery, and the team of talented visual effects artists over at Industrial Light & Magic – led by animation director Hal Hickel and visual effects supervisor Tim Alexander. Animation is a hard niche to crack — for anyone. Pixar makes is look so easy. It really isn’t. And to do something that doesn’t look like other studios is even tougher. Look at Pixar’s Brave! That doesn’t look like Pixar… it looks like How To Train Your Dragon (in this case a bear), which is Dreamworks. So even Pixar is wrestling with not looking like other studios. ILM has taken on a different tact. All of these guys come from a world of trying to make everything blend seamlessly into reality. 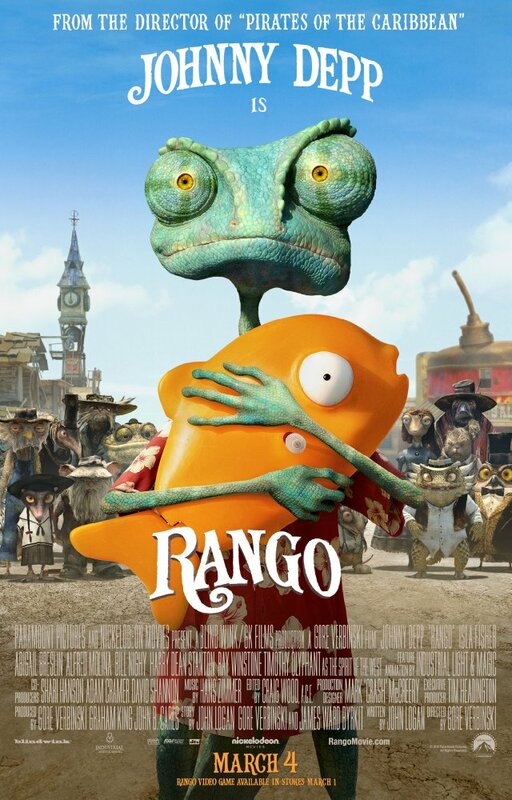 So, at the very foundation, Rango’s look is very “realistic” Despite the animals wearing clothes and talking, and living in a little town, everything is dirty and dry and gritty and worn and…well…real. But art direction doesn’t make a good movie — just look at the films of Tarsem. Story, as always, is king. And I love this story. It’s definitely an oft told tale, but as oft told tales are oft told, they are frequently worth telling. A fish (reptile) out of water (literally), uncomfortable in his skin and out of his skin, who rolls into a town that needs a hero. He plays the hero, gets called out as a fraud, walks into the wilderness in despair to find himself, and returns as the hero he once pretended to be. EDITORIAL NOTE: Hal Hickel freely admits that it was their team who put in the fart jokes, and accepts all the lumps. To Verbinksi’s credit, the actor’s were not recorded in a sound booth, isolated from the other performers and extracted out of the context of the story. They were recorded as if it were a reading, with all the actors, and a boom operator to get sound (with presumably a couple other mikes for coverage). The actors were encouraged to do whatever to get into character: dress up, bring props, etc. They were free to roam around as the urge compelled them. All of this was recorded with a digital camera and then used as reference for the animators. No motion capture. In its design, this gave the actors more freedom, and also gave the animators more freedom, pulling them away from the task of cleaning mocap data and “finessing” it (which, btw, is an art unto itself and much more credit should be given to them than they receive). There IS a dance number, regrettably. But, at least its integral to the story. There ARE pop culture references, but they are so oblique that they will probably have a longer shelf life. A pretty blatant, and humorous, call to Hunter S. Thompson and Fear and Loathing in Las Vegas — which no child would be able to reference. Well, any child that does should probably be put under strict supervision. Other references range from Sergio Leone westerns, to Chinatown, to Apocalypse Now. Missing are the prerequisite Kanye song, internet lingo, sing-a-long of some old Motown hit, overused bullet-time hand-to-hand combat. Thank God. What remains boils down to a simple story with complex characters. And each character does, indeed, have their own character. Please see this — in fact, buy it on Blu-Ray. Support good storytelling. Support ingenuity. Support thinking outside the box. The animators don’t get residuals (yet), but it promotes more work like this getting a greenlight.